Concussion Management: What is Our Role? In sports such as football, wrestling, and ice hockey, a minor “ding” or mild concussion is often an expected right of passage, or at least an expected injury. Being “in a fog” after a tackle, or a minor headache after a collision, is often considered “no big deal” to most athletes. Master comments that in boxing “being knocked-out is not considered dangerous but just part of the sport”, in fact few coaches are aware that this change in mental status is actually a sign of brain injury. 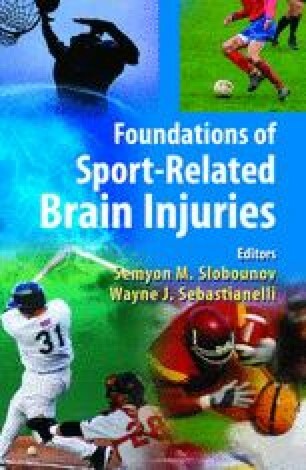 (McCrory, 2004) These neurological injuries both in isolation and in series must be taken seriously if we are to protect the athlete. Numerous physicians and clinical researchers have dedicated their lives work to a systematic approach to the early detection and management of concussions. Although it has taken a few well publicized cases of significant injury and death to bring this issue to the forefront of sports medicine, our basic understanding of concussion management needs to continue to advance. By educating the medical community on the hazards associated with MTBI, it has also made both athletes and coaches aware that further medical assessment and evaluations should not be put off when an athlete is exhibiting post concussive signs and symptoms. At the most basic level, athletes are being protected from further brain injury by not being allowed to return to play until they are asymptomatic. Ultimately our role is to protect the athlete from further harm.